Jana is one of my favorite local street artists. She sings balads/chanson in four languages, with an impressive voice and seemingly in trance. Today she had selfmade CDs for sale. How do you like her music? I'll let her know your opinion. Here are four more songs by her, though only as teasers - i.e. incomplete. Still, very enjoyable music - give it a try. Toute En Ronde, Mis Sueños, Is It Okay? and something special. If you want to have a CD by this coming star, let me know. well, she's not "a local street performer" now, not after travelling through my t1 line. Would be at home with the Dixie Chicks. i am with bernhard. b is my favorite, makes me want to hear more. Loved it b, great assertive, yet sensitive voice. Nice with the accordian. I'd buy one. Drachenblut is my favorite. 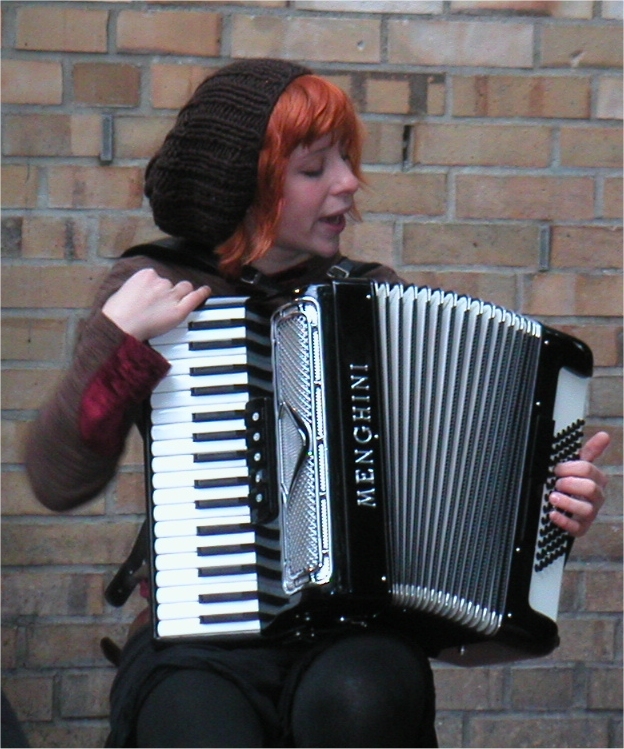 I love the sound of an accordian ...bal musette, zydeco... music that occupies a place and time. Or maybe I should qualify that remark, considering that the best-known accordionist in recent American memory is Lawrence Welk, Polka Master. @anna missed - I asked the price and Jana asked what I would pay - I said 15 and she was very suprised - I told her that I had listened often to her playing and never gave anything to her even when I should have done so, so I just payed what was due anyway. You can send me an email, and I'll get you a CD. I love her voice. Really liked Drachenblut, with its asymmetric phrasing. She'd be really spooky singing Solomonsong or Seerauberjenny. yes, she's wonderful(and very pretty too). i like gold the best. could we get a translation? my next favorite is living on a sunday then Drachenblut. they are all excellent tho. b, could you translate Drachenblut also? "Dragon blood" is my favorite; lots of interesting little twists and turns in the melody. Fauxreal, isn't Myron Florin (LW's featured accordionist) more famous for assaulting the squeezebox than Welk himself? The music is quite haunting. Is she from HH? Such a Seefahrerfabel feel to her style. I too would like buy a copy of her CD, buy don't know your email address. Mine is submitted with this comment, and I will hope to hear from you. If Bertolt Brecht and Edith Piaf had had a love child, she would be this young woman. I want her CD too. Thanks for this. Please send me payment info via the email address I've given. I've also posted a link to another forum where I know great music is appreciated. Warum bist Du nicht hier bei mir? //rep. Warum bist Du nicht hier bei mir? Why aren't you here with me? //rep. p.s. is the accordion the sexiest instrument in music? the Candy Dulfer video was quite nice even if the tatoo of an elephant on the girl at 1:17 put me off. There is something about Dave Stewart that irrates me too. I liked Annie Lennox in Eurythmics and always wanted Stewart to stay in the background....he just looks creepy to me. back on topic, Lower Saxony has quite a varied past with regard to street musicians from the Pied Piper of Hamelin to the Bremen Town Musicians. We have the privilege of living in the same time as Jana Nitsch. thanks b, this women has a lot of talent. Maybe someone could offer her a break, if she wanted one of course. was just paging down to see if a translation had been posted and realized my comment made no sense. must remember to sleep more often. it is gold that is my favorite and thanks, bernhard, for posting the lyrics. so what are the lyrics for Drachenblut? I'd also buy one of her cds. Actually, I could get more than one and donate the other to my local alternative station for their world music collection. I think she'd get airplay. In Living on Sunday, her phrasing and the way she slides across notes sounds like she likes Bjork...not a bad vocal influence, imo. oh, and as far as the sexist instrument... for females, maybe, harmonica might get some votes... nevermind. please do some more, b. that's really interesting. I can hear the percussive use of consonants even if I don't understand all the words. Your translation gets that across too. I like it even more knowing what the words mean. I have some friends who don't even like to know or hear words, and just want to hear the vocals as part of all the other sound...but I like to know the words as well. @faux - I'll try later - just deleted what I had of the following rhymes - it just didn't fit ..
@all who asked for CDs - I have them here and have emailed all of you for addresses etc. If I somehow missed anybody, please let me know (my email address is on the "About" page). @fauxreal - I have the text for "Drachenblut" now (it is the first time it was written down) and will try to translate a bit more later. b, I'd like to pick mine up in person. hey, me too. what a great idea, beq! if you come to Hamburg, please let me know. I would very much like to meet you and Hamburg is relatively close to where I live now...maybe 5 hours away. Maybe we can have a yearly Kos kind of meetup on the Reeperbahn. Will do dan of steele. Dan -- it would take someone like the wizard of annie to pull off a trip like that! I live near Kaiserslautern. My daughter goes to school in Bremen and my wife is from lower Saxony (more specifically East Fresia). We moved up here from Italy a little more than a year ago for work reasons. The local area is very nice but I still hope to return to Italy as soon as I am able. that would be too cool. I have often looked for an excuse to go to Nantes but it is not on the way to anywhere. Hamburg is a suitable substitute. But is it possible to get an email address of Jana? @M - if you mail me at MoonofA-at-aol-dot-com - I'll forward it to Jana - then she can decide to reveal or not her address too you ..
i habe send you an email for jana. please be so kind and forward it to jana. Jana Nitsch ist wirklich einzigartig...ich habe sie auch schon dutzende male in Altona (Zara, Mercado) bewundert - und jedes mal hat sie mich mit ihrer Musik in eine andere, schöne Welt gezaubert. CDs kauft man wohl am besten direkt bei ihr (jede signiert) und besser als live in Altona geht es doch nicht. Ich traf sie zufällig, letzte Woche, in einer hässlichen Einkaufsmeile, wie jede Stadt eine besitzt. Viele Grüße aus Berlin! Ich lerne Akkordeon und Jana Nitsch hat mich wircklich beeindruckt! Wann ist das nächste Konzert? Ich komme!!!!!! I fortunetly could hear her music yesterday at friend's birthday party in Altona. Hope you are all right. Check youre mail som day, looking forward to hear frome you. Thanks for the time we had. it's funny to read about myself here. i'm so happy that the reaction about my music are like this. jana, what a coincidence, i just wrote b about 2 hrs ago about some info i found out about musicians bookings here on the west coast! i see you have progressed , i totally look forward to seeing you here, i can possibly help w/accomodations, you are welcome at my home..
Really good to hear these songs again (last time was a year ago in S. Spain) . Jana if you read this hope life is good and keep making your amazing music . I'm back in Scotland for the moment , trying to learn accordion basics and other stuff . hi..... jana ist nicht nur musikalisch sondern auch menschlich einer der liebsten und beklopptesten *g* menschen die ich kenne!! SIe ist echt ein super mensch und ich hoffe und weiß dass wir musikalisch ncoh so einiges von ihr hören werden!!! Aber auch als Schauspielerin nicht zu verachten!!! !